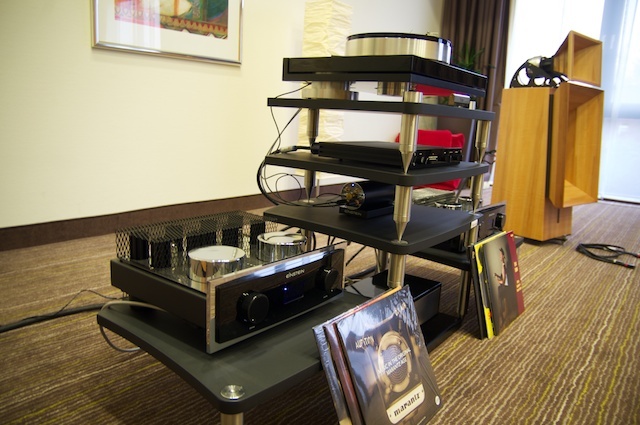 Even this year we participated to the analog Audio Forum in Krefeld. As difference from the usual shows, this time we decided to have a bigger room to play bigger loudspeakers, and we played the Gioia. Like last year, the room of the organizer used a Gran Gioia for its demonstration and it has been very well accepted. On the first day we had a straight setup, it played, but it was not possible to turn up the volume. The people were already satisfied, but we did not. We knew what was reachable with that setup and we reached maximum 60% of that. Not satisfactory. Not at all for us. In the night from Saturday to Sunday, after a good dinner in a nearby restaurant, we spent half of the night to start from scratch. What a wonder, on the second day, music was playing, finally music was in the room and cheered our ears. Thanks to Claudio and Marco for the big effort. Thanks to Hanna as well for taking care about the customers and to Jürgen from HiFi Studio Fuchs for the LPs. And most of all thank You to the whole AAA Team for the great organization of the event and the great support during the days of the show!!! See You again next year!